Jason Ricci is one of the best harmonica players working today, period. 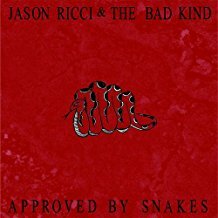 Backed by his band, Bad Kind, he has just released his 11th album Approved By Snakes. It is not an album for the faint hearted. “My True Love Is A Dope Whore,” “Something Just Arrived,” “Demon Lover,” Terrors Of Night Life,” and “Got Cleaned Up” deal with drugs, the seediness, sexuality, and the darker side of life. His gritty voice compliments the explicit lyrics as he communicates his messages. Still, any Jason Ricci album revolves around his harp. He and guitarist John Lisi are able to play off of each other and their music comes across as more of a jam band approach. Ricci’s albums are always musically interesting and creative but many times they have an uncomfortable element to them. Recommended but hold on.